Theoretical physicist Kip Thorne may be stealing all the thunder regarding the scientific advancements of Interstellar. They've submitted a technical paper on gravitational lensing to Classical and Quantum Gravity. But a much larger team of visual effects medics at Double Negative who massaged the film to life were faced with one conundrum: how to make it scientifically accurate and dazzling enough for IMAX? Here, head of special effects on Interstellar Paul Franklin (who won the Oscar for Inception) exclusively talks about how his team created a potentially precise black hole and outfitting the set with gigantic screens so the actors had something to react to. Visual Effects Supervisor Paul Franklin: "There are only four MSN IMAX cameras that we used on this film. There was a fifth that we smashed up on The Dark Knight. 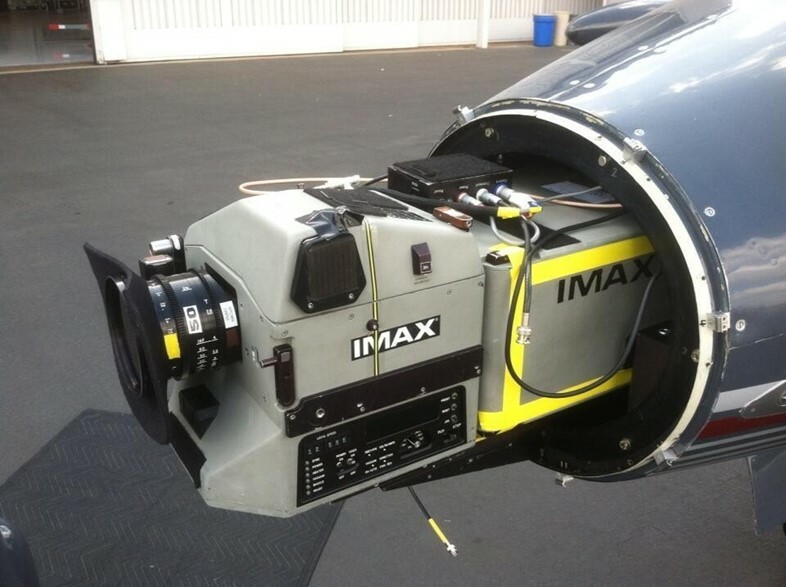 The MSN is the most advanced IMAX camera that has ever been built and you can put it in all sorts of interesting places. Here you see it on the nose of a modified Learjet. That we used to shoot some of the aerial photography used for this film. IMAX is 15 perforations across and usually it's 65 mm high, so the resolution of the negative is many times the perforation of a regular film frame. It’s equivalent to 18,000 lines of information. So your HD TV at home – this is nine times better in terms of its horizontal resolution. There’s nothing else like it. And there’s no digital system that comes close to it yet. We chose IMAX because it’s the biggest canvas that we could find to tell the biggest story that we were going to tell. The story of Interstellar." I said to Chris, every time we do a film – and this is the fifth film I’ve done with him – I have to remind him that I actually did a degree in Fine Art and Sculpture. I work with computers so therefore I must be a scientist. So I went over to meet Kip in Fairbank, California. Kip was amazing. He took me through what I call ‘Space Time 101’ – the basics of wormholes and black holes and all these extraordinary things that we wanted to depict in the film. One of the first things he said to me was, 'A black hole is not a hole in space.' I said, 'What do you mean?' Because I’ve always seen drawings that look like a massive drainpipe in space. He said, 'No no, this is called an invented diagram. What has happened here is that the three dimensions of our universe have been collapsed into two. Our 3D universe is represented as a flat sheet and we use the third remaining dimension to represent the fourth physical dimension.' I said, 'What do you mean – this was all wrong?' A cherished image from my childhood. He said, ‘Absolutely. The last thing that you want to do is to add anything like that in this film. No matter how beautiful it looks. It’s wrong and we want to be scientifically accurate.' It's from one of Kip’s ideas that Interstellar came… He came up with the story and developed it long before Chris Nolan and the rest of us joined the project." Visual Effects Supervisor Paul Franklin: "The problem we ran into with this was that (our rendering of the black hole) was very exciting scientifically but it’s just a black hole against a largely black background. And we need something dramatic. As Chris said to us right from the beginning, ‘You can do the science but if it’s not exciting for the audience, we’re going to do something else.’ So the pressure was on to produce something that would be visually exciting. 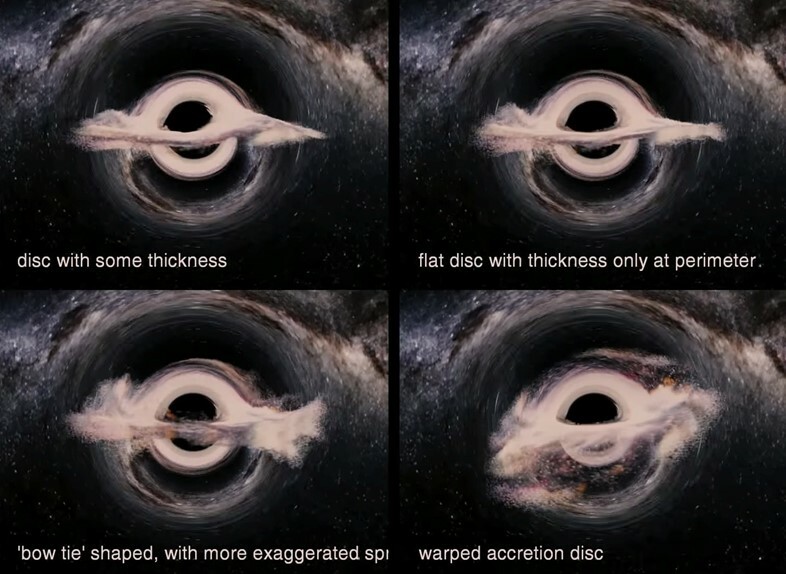 We started studying accretion discs, the big disc of matter that is being sucked into the black hole." Visual Effects Artist Eugenie von Tunzelmann: "We wanted to do it in collaboration with Kip to make sure that we were doing everything in a legitimate way. So this is called concept art but I think using the word ‘art’ might be pushing my luck a little bit. This is a little mock up (below) that I did going it could be thick, it could be cloudy… Kip went, 'Yes, no, no, yes, yes.'" Visual Effects Supervisor Paul Franklin: "This is what I refer to as The Christmas Pudding and it’s quite an exciting image for me but it’s also quite strange. I didn’t know how Chris was going to respond to it. I actually showed this to him for the first time on my laptop in the back seat of Cooper’s truck that you see in the film. And Mathew McConaughey’s hanging over the head rest peering at my laptop going, “Woah, that’s cool”. And Chris goes, “Woah. That’s quite exciting.” So we didn’t have to come up with something crazy." Visual Effects Supervisor Paul Franklin: "This is where it started getting really complicated for Eugenie and the team back in London because I’m on set shooting the movie. The black hole is not finished yet, it’s not the one you see in the movie. But it looks very exciting so we thought, “Let’s use that on set.” So we had big digital projectors shining these images onto huge screens that we’d built screens 300ft long by 80ft high. We were projecting images on to them so that we could look at them from out of the windows of our spacecraft sets. We could film it on camera and we can see this in the film. And the key thing was that the actors loved it because they weren’t just looking at a green screen. They were looking at something that they could imagine was real. So we gave them stuff and (the actors) came up to us after the shoot and said how much they had appreciated it to have something to imagine themselves in some extraordinary place. We didn’t use a single green screen in any of the spacecraft sequences on this film."